Ken Fisher is one of those true rarities: A brilliant and successful money manager who is willing to share his insights and actually able to explain them coherently. I’ve read his Forbes column for the better part of two decades, and his The Only Three Questions That Count is one of my favorite investment books of the past decade. Fisher updated Questions in 2012 with The Only Three Questions That Still Count, and I recommend you pick up a copy if you haven’t read it. 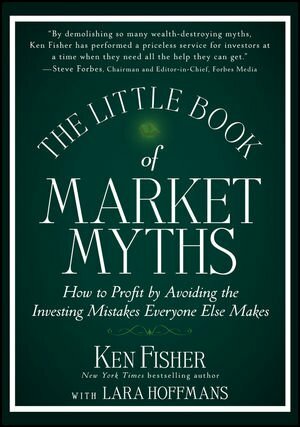 But for an introduction to Fisher’s research, I recommend you read Market Myths, his contribution to the Little Books series. Fisher is the consummate contrarian; he has all but dedicated his life to disproving traditional wisdom and rules of thumb. Market Myths is neatly broken into chapters, with each chapter representing a market rule of thumb that Fisher aims to disprove. I’ll go through some of my favorites today. Myth: Bonds Are Safer Than Stocks. Well they are, aren’t they? Not exactly. Yes, bonds are less risky if by “risk” you mean “short-term volatility.” Yet as Fisher show, over long investment horizons—say, 20 years—the volatility of stocks falls to nearly identical levels as that of bonds…and yet stocks have historically offered returns that are roughly double that of bonds. And we haven’t even touched on the issue of inflation, which hits bonds far harder than stocks. But more fundamentally, stocks represent something that bonds never can: an ownership interest in a growing business. The best you can ever hope to receive from a bond in terms of capital appreciation is its face value at maturity. Yet the upside potential of a growing company’s stock is quite literally limitless. I don’t know if it is inherent laziness or something else, but finance seems uniquely susceptible to overly simplistic rules of thumb. One that Fisher and I both find particularly offensive is the notion that your asset allocation can be determined by subtracting your age from 100. For example, a 70-year old should have 30% allocated to stocks (100-70) and 70% allocated to stocks. I recently picked apart this rule of thumb in an InvestorPlace article, noting that it completely ignores the single most important element to any investment decision: valuation. Bonds are expensive today relative to stocks, so advising anyone over the age of 50 to keep half their money in bonds is to doom them to disappointing returns for decades into the future. On this count, I actually disagree with Fisher in principle. Yes, Fisher is correct that Federal debt levels have little impact on the stock market and, in some cases, may actually help to fuel its rise. That does not, however, suggest that Americans should be complacent about high levels of government debt. As we see in Europe today, there are consequences to be paid for fiscal irresponsibility. Eventually, they require painful austerity—meaning tax hikes and spending cuts. Still, Fisher is absolutely correct when he says that the high current levels of Federal debt are not a valid reason for avoiding the stock market. Our debt levels as a percentage of GDP were far higher following World War II, and the 1950s and 1960s were a golden age for American prosperity and saw some of the strongest market returns in history. Market Myths is chocked full of contrarian investment knowledge that will cause you to think. I recommend that you pick up a copy, and I recommend that you keep an open mind. You won’t agree with everything. I certainly didn’t. But if Fisher makes you question your assumptions, then he accomplished his goal—because ultimately, this is the purpose behind the book. My compliments to Fisher on a great addition to the Little Books series. In “Human and Economic Evolution,” I discussed how natural selection is alive and well among humans, and used such examples as genetic resistance to malaria among Africans and high aptitudes in the maths and sciences among Ashkenazi Jews. Today I’d like to discuss an interesting finding reported in The Economist that is relevant to the China/Tibet dispute, and I’m going to tie it into a broader discussion of the human brain and investment psychology. Tibetans and their supporters in Western countries have long contended that the Han Chinese do not belong in Tibet. New genetic research suggests they may be correct–to an extent.